The “Buddy Bench” is a simple idea to eliminate loneliness and foster friendship on the playground. Representatives from the Community Foundation of Middlesex County and Rushford Academy recently joined students, teachers and parents at Essex Elementary School for a very special ribbon cutting ceremony. 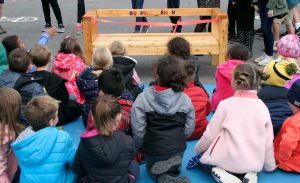 The Community Foundation’s Council of Business Partners Fund presented a Buddy Bench for the school’s labyrinth site, an initiative to create an outdoor space of community and inclusion. The wooden bench, with the words “Buddy Bench” spelled out in bright-colored letters, was built by at-risk youth from Rushford Academy in Durham. 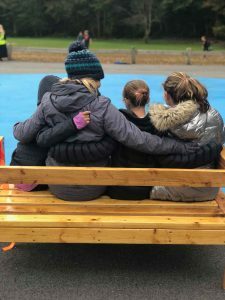 Buddy Benches provide a conduit for children to “buddy up” with those who may be feeling isolated during recess or other free play activity times. The Rushford residential teen students are learning positive life skills and giving back to their community by building and donating benches to local schools, with grant support from the Community Foundation of Middlesex County. 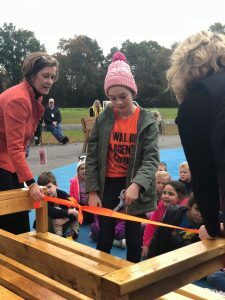 Two Rushford Academy students were on hand to personally present the bench to an enthusiastic gathering of Essex Elementary students, teachers and parents. The Rushford Academy “Buddy Bench” project is made possible through a partnership with Rushford, a Hartford Healthcare Partner, and the Community Foundation’s Council of Business Partners, a philanthropic group of local business people who pool their resources to support positive youth development. The initial idea for the bench building project came from a Rushford Academy resident supervisor’s desire to engage the young men recovering from substance abuse in an interactive activity that would foster teamwork, commitment, and useable skills. All that was missing was the money to cover the cost of the bench building materials. Thanks to the generosity of the Community Foundation’s Council of Business Partners and the At-Risk Boys Fund, the residential school students began building the benches for area schools. When other Community Foundation donors heard about the initiative, they enthusiastically stepped up to help fund benches for every elementary school in Middlesex County. For more information on this or other grant funded programs, contact the Community Foundation of Middlesex County at 860-347-0025 – we welcome conversations with Good People Doing Great Things in Middlesex County (and beyond).